Research conducted by Loughborough University in the UK suggests that drivers falling asleep at the wheel are responsible for one in five deaths on motorways and trunk roads writes John Loughran. The Sleep Research centre based at the university is the UK’s leading laboratory for basic and applied research into human sleep. It maintains a world wide reputation through its innovative work and a sustained publication output in a broad range of top academic journals. The centre has state of the art facilities for sleep research with bedrooms for overnight monitoring, a sound proof chamber for measuring psychological performance, a fully interactive car simulator, a road track and an instrumented car for monitoring road driving. Professor Jim Horne, who heads up the Sleep Research Laboratory revealed that "those most at risk are young people, who tend to stay up late, sleep too little and drive at night. Other lifestyle groups whose occupations put their lives at risk behind the wheel include shift workers, the emergency services and nurses in whose hands we often place our own lives, long distance lorry and coach drivers and ironically even driving instructors." He continued: "previous research has identified that drinking coffee can be beneficial to sleepy drivers. However, as there are too many variables in the quality and preparation of coffee, advising drivers to drink coffee as a stimulant can give them a false sense of security." 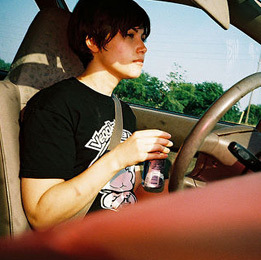 The Sleep Research Laboratory investigated the effects of caffeine-based energy drinks on sleepy drivers as a scientifically quantifiable alternative to drinking coffee. Groups of 12 volunteers were chosen from the population most at risk - young adults especially men under 30. The groups were tested in a full size interactive car simulator that replicates motorway driving conditions. The immobile car simulated driving conditions such as bends, hard shoulders, rumble strips, lane drifting, monotonous dual carriageway driving, in fact all the conditions associated with motorway driving. At regular intervals the volunteers verbally reported their sleepiness by means of a nine point scale from "extremely alert" to "very sleepy". After a prolonged period of driving the volunteers were given identical tasting drinks with neither the driver nor the tester knowing the make up of the drinks. The active ingredients caffeine, taurine and glucuronolactone had been removed from the control drink, thus having the taste but not the potential benefits of the energy drink. The results of those using the energy drink were impressive. Half an hour after the ingestion of the energy drink (250mls) there was a marked decline in the number of incidents associated with sleepiness and this improvement lasted for 90 minutes. When 500mls of the energy drink had been ingested the number of driving incidents associated with sleepiness was virtually eliminated for 90 minutes and substantially reduced for the remainder of the drive. The Sleep Research Laboratory said the results were encouraging, especially against the background of the growing emergence and recognition of driver sleepiness. The RAC in the UK has highlighted driver sleepiness as one of its key concerns. Many drivers believe they can easily overcome sleepiness and continue with their journey. Often they succeed and reach their final destination but sometimes they don’t. Even a few seconds doze at the wheel can kill. Professor Horne and his team has stated that driver sleepiness is avoidable and following the results of this research drivers should keep a couple of cans of a functional energy drink in the glove compartment, to be taken by the sleepy driver during a break from driving.